With various proposals coming forward at Toronto City Hall to look at either removing or capping the city's municipal land transfer tax, I guess it's time to ask if there might be good reason for getting rid of this thing. Spoiler alert: there is not. Despite some noise from the real estate industry and a continued anti-tax stance from Mayor Rob Ford, no one has made a compelling argument for why the elimination of the land transfer tax — which adds about $5,000 to the cost of a $450,000 home — is a particularly pressing issue. Especially not when people have to push real hard to get things like homelessness and youth violence on council's agenda. And there is nothing approaching a plan for how City Hall could recoup the more than $300 million in annual revenue it'd be voluntarily giving up. Which is a really important factor, especially when you consider that council needs to define strategies to reduce homelessness and youth violence and it's very unlikely those strategies will be well-served by a few hundred million in budget cuts. The thing you have to remember about the land transfer tax and the since-killed vehicle registration tax is that these were not haphazard measures implemented to justify out-of-control spending on pet projects. Rather, their implementation in 2008 followed the guidelines identified in the city's 2005 Long Term Fiscal Plan. That plan, in addition to calling for things like a share of the provincial sales tax and a Queen's Park commitment to funding the TTC's operating budget, also said the city should develop more diverse sources of revenues. This was a good idea when it was first floated almost a decade ago and it remains a good idea today. Above is a chart showing city revenues from property taxes and the land transfer tax. It's immediately clear that land transfer revenues have offset the need for larger increases to property tax revenue. Without the new tax, council would be looking at a residential increase between — seriously — eight and 15 per cent if it were to replace revenue on a one-to-one basis. If you're appreciative of the low property tax increases passed at Ford's City Hall, thank the land transfer tax. Sure, it would be theoretically possible to phase that kind of increase in more slowly, but why would you want to? Property taxes are regressive and complicated. They don't rise or fall with inflation or the economy. And, unlike with the land transfer tax, potential negative effects of large property tax increases are well-documented. Add a sharp tax increase to a hot real estate market and persistent gentrification and suddenly vulnerable people are forced out of their homes. And then there's the fact that, according to 2008 data compiled by City of Toronto staff, the 35 largest cities in the United States rely on property taxes to fund only 18 per cent of operating revenues. 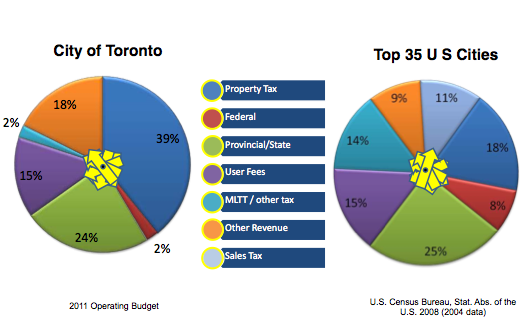 Toronto, meanwhile, hits the property tax base to fund almost 40 per cent of the total budget. Revenue diversification is a good thing. Without the land transfer tax, council would be on the hook for finding another kind of tax or fee to offset the revenue. And it'd be hard to find one as fair and effective as the land transfer tax. But what about the real estate market? There's little evidence that the introduction of the land transfer tax has had any detrimental impact on the health of the real estate market. It may have reduced speculation and kept prices from approaching Vancouver levels, but it's hard to spin that as a bad thing. If using policy to keep the housing market from overheating is bad, then federal Finance Minister Jim Flaherty should be Public Enemy Number One. Here's a chart of annual housing starts in Toronto (the 416) and surrounding municipalities (the 905) since 1996, built with data from the Economic Development committee's quarterly Economic Dashboard. In other words, this shows the number of new housing units being built in a given year. And here's all MLS sales and average selling price in Toronto, as presented in the same Economic Development committee report. It dates back to 2007. If you didn't know that the land transfer tax was implemented in February of 2008, I'd bet it'd be pretty hard to tell from this chart. In fact, none of the doomsday narratives show up on these charts. There wasn't a precipitous and sustained drop in the number of Toronto home sales. Developers didn't move out of Toronto and into the 905. And there wasn't a big rush toward the suburbs as home buyers looked to avoid the Toronto-specific tax. None of that happened. It's been five years since the tax was implemented. These days, Toronto has major issues that deserve our attention and little room in the budget to accommodate a $300-million cut. New taxes are never going to be popular and there's always going to be an appetite to get rid of them, but it's long past time to move on.